The technology, service and content providing on-line solutions for the teaching and practice of speaking skills. Langblog is a blog with audio and video functionality which is embedded into a virtual classroom. Langblog is used to practise and improve oral production. The Tandem tool is a content management system that facilitates the distribution of different materials to students who are engaged in speaking interaction tasks carried out synchronously. Students can be given differing content to support their interaction and is based on goal-oriented communication activities. Tandem offers its maximum potential when used with the Videochat tool and the Open Educational Resources repository. Videochat supports a video conference of up to six participants using audio or video. The functionalities of the tool include that each participant can initiate a conference session. Other functionalities associated with this tool include the recording and archiving of conferences. It may be used in conjunction with Tandem in order to facilitate pair and group conversation, and helps teachers improve students’ speaking interaction skills by allowing the recording of conversations. 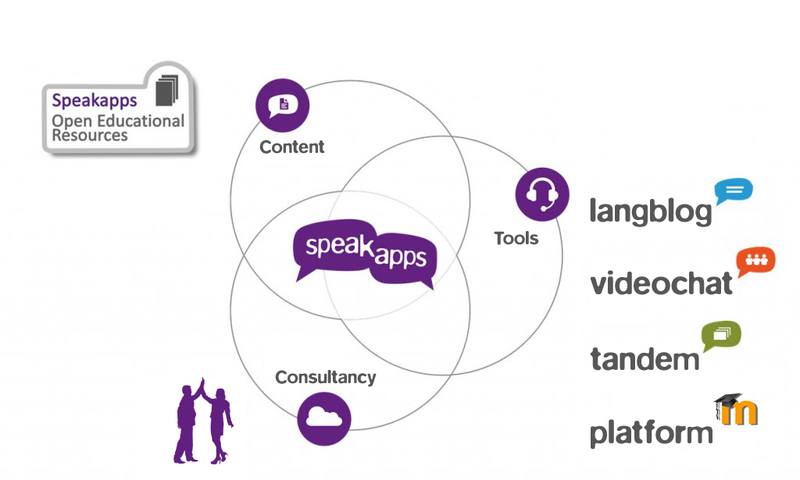 The SpeakApps platform includes an Open Educational Resources site to save and access oral production and speaking interaction task and activity sequences. Ideas and tasks can be shared here. The Open Educational Resources combine with Tandem and Videochat to generate speaking interaction tasks for students.